A parliamentary report of 1777 recorded parish workhouses in operation at Westborne (for up to 90 inmates), Bosham (26), West Dean (18), and Stoughton (50). Funtington had a parish workhoused located at West Ashling. 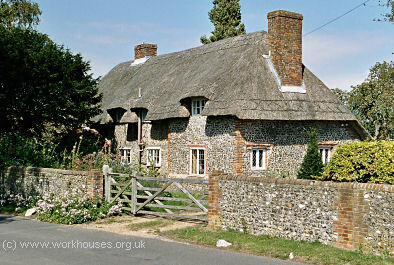 Bosham's parish workhouse, now cottages, was situated on the village's quay. Bosham former parish workhouse, 2004. Chidham's parish workhouse stood on what is still known as Poor Lane. Chidham former parish workhouse, 2004. Sussex: West Bourn [Westbourne] (3), Bosham (2), Chidham, Compton, West Dean, Funtington (2), East Marden, North Marden, Up Marden, Racton, Stoughton, West Thorney. The population falling within the union at the 1831 census had been 6,585 with parishes ranging in size from North Marden (population 31) to Westbourne itself (2,031). The average annual poor-rate expenditure for the period 1831-34 had been £8,095. The new Westbourne Union briefly planned to make use of the former parish workhouses at Westbourne and Bosham. Bosham was to accommodate the aged and infirm, who were transferred there by cart, while. Westbourne was to take the young and able-bodied. One elderly inmate, Thomas Fry, remained at Westbourne employed as Warden for a remuneration of 6d per week. However, in 1835, following criticism from Assistant Poor Law Henry Pilkington about the lax regime at Bosham, it was closed down with Westbourne becoming the Union's only workhouse. The Poor Law Commissioners authorized the sum of £2,000 on its enlargement. The Westbourne workhouse was situated to the north of the town. According to Kelly's Directory for 1887, it could by that time accommodate 220 inmates. Its layout and location can be seen on the 1910 map below. The workhouses was closed on 1 October 1925. The premises were then converted for use as a children's home which remained in operation until 1933. The buildings were subsequently demolished although parts of the surrounding walls survive. By the 1915, the Westbourne Union had established children's homes at Stein Road, Southbourne. In 1924, the homes could accommodate 18 children, with Miss Chamberlain as its Superintendent. West Sussex Record Office, County Hall, Chichester, West Sussex PO19 1RN. The main surviving records are the Guardians' minutes (1835-1930). Watson, Ian (1991) The Westbourne Union: Life In and Out of the New Workhouse (Westbourne Local History Group).